What would typing faster be like? What would help me get there? 10fastfingers.com says that my average typing speed is 104 wpm (over 13 tests), with a peak of 112wpm. This is on Dvorak, which I taught myself in 2003. On QWERTY, I’m slower (85-90wpm) and definitely not as happy. I like the way Dvorak alternates hands. I learned QWERTY instinctively and Dvorak properly, so I have much better finger-use on Dvorak. Having recently discovered the typing practice feature on 10fastfingers, I’ve been working on getting rid of the backspace instinct. This is one of the keys to typing faster: increase your speed beyond accuracy, and then let accuracy catch up. Incidentally, the same trick works with speed-reading, where you need to push yourself to read faster than you can comprehend. I could use AutoHotkey to make my backspace key useless. Hah! For good measure, I’ll disable my left Control as well, since I need to get used to using Caps Lock instead. I tried setting Backspace to SoundBeep before, but that got in the way of mapping something else to Backspace. That’s why the keyboard shortcuts are playing musical chairs. Shut down that typing inhibitor and you’ll type faster, or at least that’s how the theory goes. I’m somewhat concerned that this will result in Training The Wrong Thing. After all, practice is just as good at solidifying mistakes as it is in improving performance. ;) (Practice Perfect is an excellent book – have you read it?) Still, since I’m supposed to reread my blog posts for typos anyway, I guess it can’t hurt. Typing speed isn’t my bottleneck, though. It’s thinking speed. But since that seems to be harder to improve (maybe games? improv? ), I can work on other aspects instead. As for code (the other place where typing speed really pays off), I find that the more I learn, the less I need to write. Increasing my productivity is more about understanding the problem or idea, knowing about (and applying!) good practices, and making the most of available tools and libraries. It might be fun to spend a few weeks seeing if this is a skill that yields to deliberate practice. Do you want to try the deliberate practice experiment with me so that we can combine our results? It probably looks like a 10-15min daily practice session (10 minutes of typing practice, and a few tests). First, I have to get used to the weirdness I’ve imposed on myself (no Backspace key, no left Control key). Then it’s off to the races! 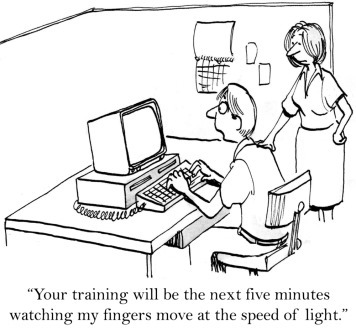 What’s your typing speed? Have you steadily increased your speed, or have you broken through plateaus? How? Update – August 19, 2013: Mel Chua suggests stenography (http://plover.stenoknight.com/). That looks promising, especially once Stenosaurus becomes available. Things to start learning next month!